Manual hoists COMEPAL PMC with galvanized chain or stainless chain allow the vertical lifting of heavy loads at the desired height. Light and durable, it suits the standards in order to offer the greatest security for COMEPAL users with a minimum effort. Robust and efficient manual chain hoists fully made in steel. 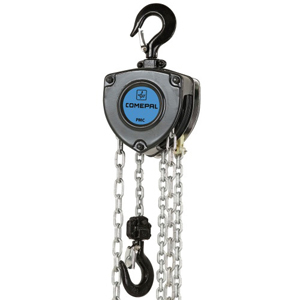 Standard lifting capacity of 250 kg to 5 T.
1 chain fall up to 3 T capacity. Machined chain sprocket and gears. Galvanized lifting chain at steel links with corrosion protection. Automatic load brake mechanism at double discs. Rotating hooks equipped with safety latches. RAL 7021 high-resistance powder coating. Serial number plated on the frame. Many lifting heights and capacities. Stainless hooks and chains available on request.